Baal HaSulam, “The Freedom”: Prior to the giving of the method of Kabbalah, the children of Israel had assumed the relinquishment of any private property to the extent expressed in the words, “a Kingdom of Priests,” and the purpose of the whole of Creation—to cleave unto Him in equivalence of form with Him: as He bestows and does not receive, they, too, will bestow and not receive. This is the last degree of Dvekut (adhesion), expressed in the words, “Holy nation”…. How do we exit this world? We enter the period of preparation. After that we cross the Machsom (the barrier separating us from spirituality) and rise to the level called “Hafez Hesed,” that is, bestow for the sake of bestowal. This is the degree of Bina. 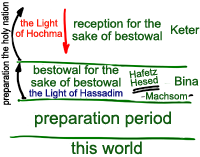 Then, we rise to the degree of Keter, to reception for the sake of bestowal, and receive the Light of Hochma (Wisdom), while on the level below, we received only the Light of Hassadim (Mercy). On the degree of Bina, we cancel “private property,” meaning arrive at the state of Hafez Hesed and are not supposed to use our receiving desire. This is also preparation, the phase of the correction of the vessels. The reception of the Light takes place on the next degree. Since I had my first experience with the Upper Force, I was looking forward to this day, the day I start enjoying bestow… Why is this path called Spirituality so painful? Please Creator give me some sugar!!! Allow me to cross the Machsom!!! Allow me to Connect with Joy!!! You know my heart, you know I will fight for You until my last drop of blood!!! Allow me to enter in the state of Love!!! Thank you very much for your explanations. Is Bina or bestowal for the sake of bestowal nullifying our ego to give instead of receive and receiving for the sake of bestowal is receiving the method of nullifying our ego in order to share it with others?